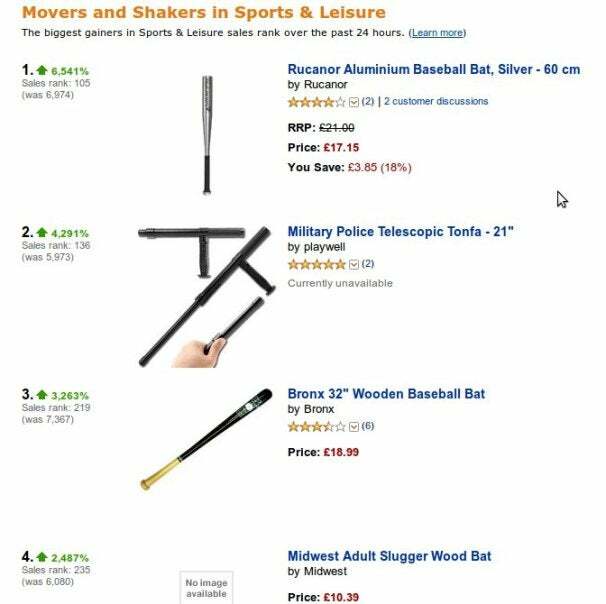 Sales for baseball bats on Amazon UK have risen by more than 6000 percent over the past 24 hours, presumably due to the civil unrest engulfing the island nation. But it's unclear whether the sales of sluggers are due to trouble makers gearing up for a fight or concerned citizens looking after their own interests. Surely it's not a groundswell of baseball fever? The most popular bat of choice Tuesday is a 23-inch Rucanor aluminum bat selling for about $28. The item has risen from 6,974 to the 105th most popular sports and leisure item on Amazon UK. The next most popular is a military police baton, which is followed by another five baseball bats ranging in price from $15-$30. The issue has sparked something of a debate on Hacker News where the baseball bat spike was first noticed. While some argue that a baseball bat would be a great disguised weapon when you're looking to destroy property, others have said shopkeepers and home owners may be purchasing bats to take care of their properth and families amid the chaos. The Guardian has a video showing Turkish shop owners in East London protecting their stores: Several men carry various pipes, sticks, and other implements. Perhaps a bigger question is whether Amazon needs to step in and refuse to ship the bats until the civil unrest has subsided. Of course, that position assumes the bats are being used by rioters or well-intentioned citizens looking for added protection from the violence just outside their front doors. Some commenters on Amazon UK have already made up their mind and are asking the online retailer to ban the items temporarily. "Call upon amazon.co.uk to ban this item temporarily as it is obviously currently abused as a cheap, quick weapon to be used in the london riots," said Amazon user Patrick Hoelscher. Others retorted by arguing the bat sales should continue so that home owners can have some manner of protection. But perhaps the most level-headed response came from Amazon user V. Wevell. "Even if they are being bought by respectable home and business owners, they should be banned from sale temporarily," V. Wevell said. "Vigilantism is not the answer. Get these items off the shelves, we are all scared and angry in London and need to know that measures are being taken to help us to feel safe in our Cities again." Of course, another possibility is that a spike in baseball bats at this time of year is not unusual for the UK. Amazon has been asked to comment, and we will update this post should the company respond.